Getting in and out of Zion National Park is both simple and spectacular, passing the high canyon walls, topping flat desert mesas, entering forested mountains and crossing the rushing streams of the area. Zion National Park is accessible from a number of different gateway communities, including the nearby St. George and Cedar City, as well as farther out Las Vegas and Salt Lake City. Because of the wide expanses of open land, the area has a predisposition towards personal transportation, such as a car, truck, RV or motorcycle. That said, guided tours are a popular option to get out of the car and let someone else worry about the driving. Zion National Park has four separate entrances, accessing different sections of the park. The South Entrance is the most popular entrance, at just over 40 miles from St. George. Immediately south of the entrance in Springdale, there are hotels, restaurants, tour companies and other services. Coming in from Mt. Carmel Junction, the East Entrance connects to the South Entrance via the Zion - Mt. Carmel Scenic Highway, which is considered one of the best scenic routes in the country. 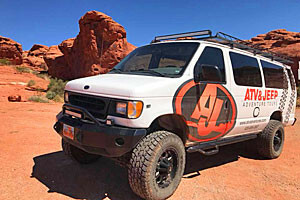 Many travelers connect this with Bryce Canyon or Grand Canyon for a spectacular driving experience. As the most accessible point to I-15, the Kolob Canyons Entrance is on the far west side of the park. This entrance accesses the northern section, named Kolob Canyon, which is more remote and isolated than the lower Zion Canyon. The Kolob Terrace Entrance runs through the park from Virgin to the Kolob Reservoir. This is the least visited area of the park, but accesses unique features such as Lava Point and The Subway. The road is not plowed during the winter months. Served by most large airlines, Las Vegas is the closest major airport to Zion Canyon at 160 miles away. The Salt Lake City airport, served by major airlines and a hub for Delta, is 300 miles to the north. Just 40 miles from the park entrance, St. George is the closest airport served by commercial airlines. Cedar City is another option as a regional airport under 60 miles away. Both are served by Delta through Salt Lake City. Having personal transportation has advantages in an environment like Zion National Park, where distances between sights can be large and some of the best parts of the park are the scenic drives. Rental cars are widely available at both national and regional airports, and throughout the area in general. Airport shuttles are available to St. George from both Las Vegas and Salt Lake City. Within St. George, transportation is relatively simple with their public bus network that covers most of the city. From the South Entrance of Zion National Park, there is a free bus system that follows the Zion Canyon Scenic Byway, making it simple and easy to explore the park without worrying about parking or traffic. There is also a free bus route connecting Springdale to the park entrance.